Without fail since 1989, SBS has broadcast the black and white 1963 recording of the comedy sketch on New Years Eve. This is a tradition followed by broadcasters across the globe. 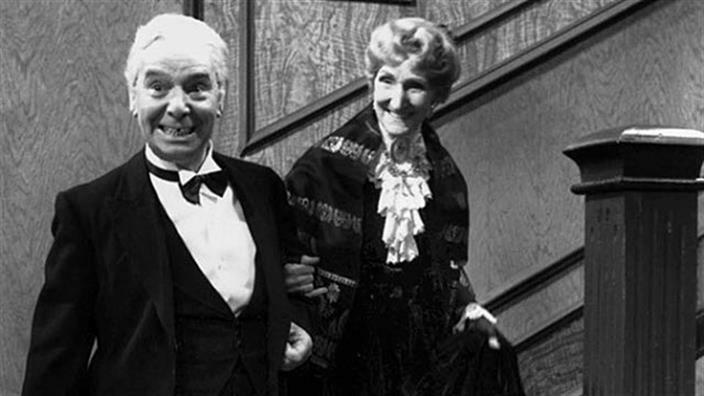 For those who came in late: Dinner for One is an 18-minute comedy sketch starring two British comedians, May Warden and Freddie Frinton, as a 90-year-old socialite and her manservant, who impersonates all her long-dead friends as he makes his way around the dinner table. In 1963, a single-take performance of the sketch – in English – was filmed for German television. And every year, TV stations around the world play the resulting footage on New Year’s Eve. “SBS has aired Dinner for One on New Year’s Eve every year since 1989 – that’s not quite as long as we’ve been showing Eurovision, but longer than we’ve had the World Cup,” explained channel manager Ben Nguyen. The tradition that led to Dinner for One becoming the world’s most repeated program began in Germany. The sketch, which relies on subtle slapstick as well as dialogue, had Teutonic audiences laughing at the sight of an old butler growing steadily more drunk as he sampled the alcohol set out for each of the four guests at each of the four courses. Frinton was an expert at physical comedy, tripping over a rug every time he came in with a new set of dishes. German programmers discovered it was the perfect length to fill a gap in the broadcast between longer shows, and started scheduling Dinner for One – along with a short introduction in German – every New Year’s Eve at 6pm. Audiences responded, and it rapidly became an annual tradition that spread across Europe and the world. Today, it’s become a thing globally, with countries such as South Africa, Sweden (where it was temporarily shelved because of the butler’s boozing), Denmark, Latvia and, of course, Australia. Speaking of which, Nguyen had his own personal comedic moment with the sketch, which became something of a trial by fire for him in his new role. Obviously the effort was worthwhile, given the response people have given him each year. The tradition holds firm in 2016 with Dinner For One scheduled at 6:10pm on SBS this new years eve.